Why Should You Sit Through It? People get tired of looking at old, chipped table tops and want a fresh new look. Or, a new style is in order. Whatever the case may be, replacing a table can be expensive. This video gives you an alternative to refurbishing a table top you already have and saving money from buying a new one. Although the penny table is using actual money for decoration, it is relatively cheap. If you like this idea but are not exactly a crafty or handy person, this video helps guide you with basic steps to create this work of art. This takes a lot of stress and pressure off on your part. Let’s face it; DIY projects can sometimes test your nerves. The video will help ensure that the atmosphere remains calm and that you will get a quality finished product. 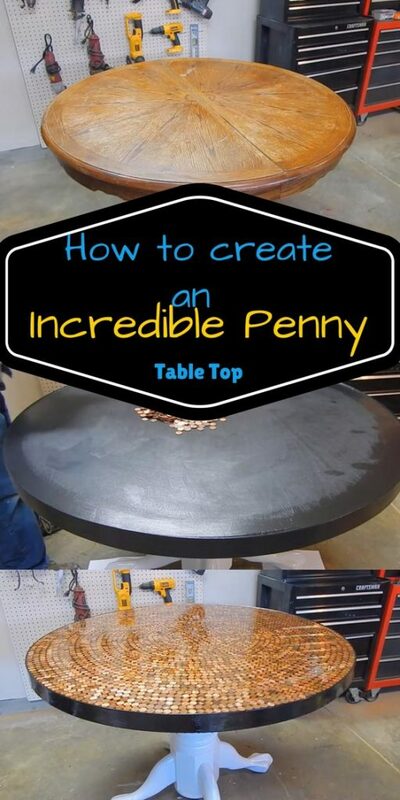 Why Should You Make a Glazed Penny Table? It has already been established why pennies are involved. It looks cool! Even then, hundreds of pennies only make a few bucks so it is very practical for people who are spending based on a budget. The glazed coating replaces the need for glass or outer wood on top which may be something that you like. Even for a DIY project, it did not take a lot of time or effort to create when compared to something like painting. It gives the piece of furniture a more modern flare.